Over the years, Tacori have earned a reputation for creating some of the most desirable diamond rings in the world and the brand has now become synonymous with exceptional diamond engagement rings. Thanks to their unique craftsmanship and individual designs, Tacori are true artisans when it comes to bridal jewelry. Over the past four decades, Tacori have been lovingly handcrafting rings in their design studio in California, USA. Their wide range of styles ranges from simple and clean, to ornate and intricate, always offering impeccable quality and beauty. Tagori was established by Haig Tacorian, who left Europe in 1969 to start a new life in the United States. Once he had settled in California, Haig and his wife, Gilda, devoted themselves to crafting fine jewelry that brought together their distinctive European flair with the effortless sense of style that is synonymous with the Sunshine State. 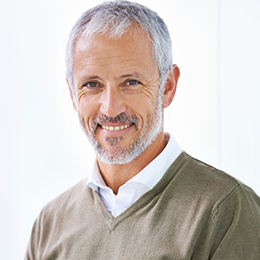 Today, having spent decades building the brand’s unrivalled reputation and worldwide acclaim, Haig remains at the head of the company as CEO, whilst his son, Paul, is the President of Sales and Marketing, whilst his daughter Nadine is the company’s President of Design and Operations. Tacori are elite designers and manufacturers of rings, constantly going above and beyond to cater to the needs and expectations of their ever-growing customer base. The many designs in Tacori’s engagement ring collection can be easily customized to accommodate any size and type of center stones. Tacori engagement rings contain 95% platinum and 5% iridium, rather than the usual material composition used by other jewelers. As a result, they are shinier and much tougher than the other platinum rings you’ll find on the market, making them more resistant to everyday wear and tear. Tacori offers a countless array of engagement ring designs to choose from, encompassing some 13 signature collections. The Tacori engagement ring line consists of a number of distinctive collections, each of which embodies unmistakable elements of modern glamour and old world elegance. So, let’s take a look at some of their key collections, of course you can find their full collection and further information on the official Tacori site and also at Whiteflash here. The Sculpted Crescent Series offers a fresh new take on Tacori’s Classic Crescent, adding a distinctly modern edge without compromising the ring’s unique personality. This diverse collection offers simple yet refined designs with a bold profile view of the trademark crescent in solid, high polish form. Flexibility and versatility are at the very forefront of the increasingly popular Dantela Series, accommodating many different diamond shapes and enhancing the center diamond with carefully placed pave melees. With their traditional, beautiful appeal, the designs in this series are characterized by sleek profiles and slowing lines. With their distinctly vintage feel, the designs in the Blooming Beauties Series feature center diamonds surrounded by two rows of pave set diamonds that resemble the petals of a flower unfolding. Within this collection, you can choose between a high foundation, which delivers a bolder look, or a lower foundation, which is daintier yet equally as brilliant. When you invest in a Tacori engagement ring, you are buying so much more than a piece of jewelry. In recognition of this, the band offers a complimentary engagement ring service, including sizing (whenever possible), general refurbishing, and engraving touch ups. For ongoing care, you can take your Tacori engagement ring, along with its Certificate of Authenticity to your nearest authorized Tacori retail partner, who will send your ring to the brand’s California Design Studios for repair and maintenance. The company is very specific about the fact that, they do not guarantee any work done by any outside jeweler, including authorized retail partners. 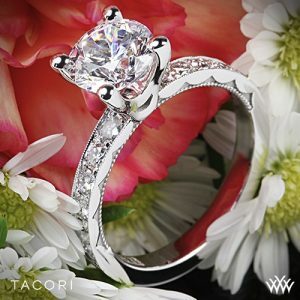 What’s more, if you have any work performed by an outside jeweler, no future work carried out by Tacori is guaranteed. You probably won’t be surprised to hear that, when it comes to pricing, Tacori rings fall into the upper end of the scale, typically costing between 2-3 times as much as a standard, mass-produced setting. These prices are very much justified, however, when you take into account the exceptional level of quality, craftsmanship, and attention to detail involved in crafting each ring. Each and every Tacori ring is individually hand-crafted in California in the United States by highly skilled and experienced artisans. Of course, the premium price is also a reflection of the brand’s premium status and, as you would expect, you are very much paying for the Tacori name. But it’s a name that’s well worth paying for. Whilst it is obviously possible to get a replica Tacori engagement ring made by a jeweler for a substantially lower price, we would strongly advise you against this for a number of reasons. Firstly, it is worth noting that it is actually illegal for any other jeweler to copy Tacori’s trademark designs. In addition to this, no matter how skilled your jeweler or how much you pay, a replica Tacroi ring just won’t match up to an authentic Tacori, in terms of quality or beauty. If you’re thinking of purchasing a Tacori engagement ring, it’s vital that you buy it from a genuine, approved seller. Unlike other Tacori pieces, engagement rings cannot be purchased through the brand’s website. Instead, they can be bought from exclusively from authorized retailers throughout North America, who have been hand-picked to stock and sell the rings. 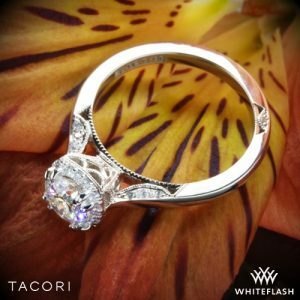 Looking for an authorized Tacori Dealer? Mayfair Jewellers is great if you’re based in London and Whiteflash and Since1910.com if you are buying online or in Houston or New York respectively. 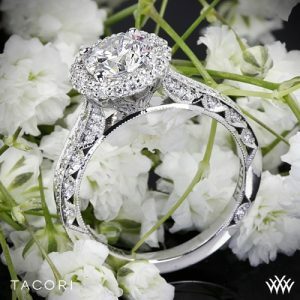 For fully authentic and certified Tacori Engagement rings, we’d recommend heading to Whiteflash as their A Cut Above Diamonds are in my opinion the best quality. Take a look at their review here. When you’re buying an engagement ring, or any diamond ring for that matter, it’s important to ensure that your diamond is ethically sourced and conflict-free. Tacori pride themselves on adhering to the highest ethical principles in the Diamond industry. All diamonds used in the brand’s designs have been fully certified to be Conflict-Free, in line with the Kimberley Process and as approved by the World Diamond Council. All things considered, Tacori engagement rings really do stand out from the crowd. Yes, you will pay a premium price for their pieces, however, in terms of quality, finish, beauty, and aesthetics, the brand has proven that this premium is well worth it.